The vexing vaccine debate: Should parents be able to 'opt out' of immunizing their children? A needle pokes through the protective film of a vaccine vial, while a hand simultaneously pulls up on the needle’s handle, sucking in an engineered cocktail that includes elements like gelatin, phosphate, chick embryo cell culture, and human lung fibroblasts. 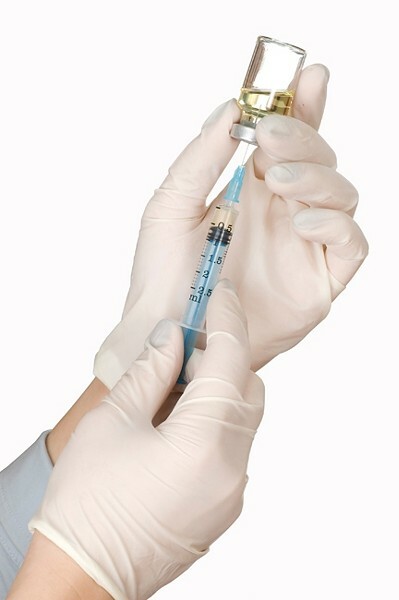 As that needle pushes through someone’s skin, it delivers a combination of substances designed to build up that person’s antibodies to measles, mumps, and rubella (MMR). Those ingredients are only in one manufacturer’s version of the MMR vaccine and are listed on the U.S. Centers for Disease Control (CDC) vaccine ingredients list. DTaP (diphtheria, tetanus, and pertussis), HPV (human papilloma virus), polio, and varicella (chicken pox) vaccines are also on the four-page-long list of inoculable items engineered to protect the world’s population from infectious diseases that officials consider to be harmful to human health. 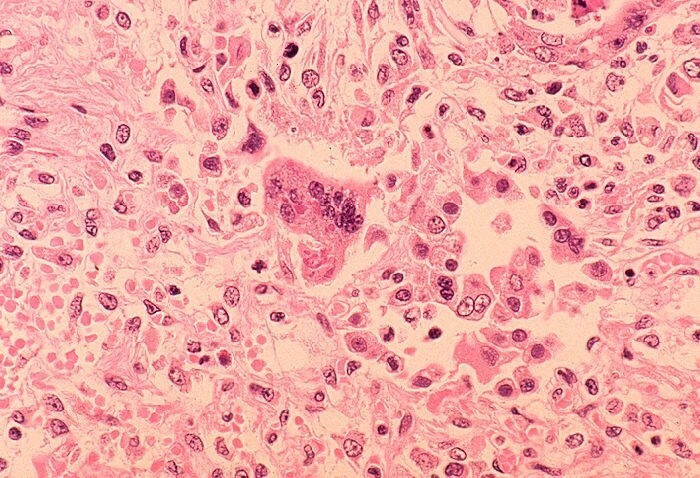 MEASLES: This image depicts the measles virus, a vaccine-preventable disease that health officials say is on its way back due to parents who choose not to vaccinate their children. Between December 2014 and March 6, there have been 132 measles cases confirmed in California, 74 of which were adult cases. Among the cases the California Department of Public Health (CDPH) had vaccination information for, 55 were unvaccinated individuals. Basically, the thought is this: If enough people build up the antibodies needed for immunity from an infectious disease, then even the people who are unable to get the vaccine—say, because they’re too young (under the age of 1), they’re allergic, or they have other health issues preventing them from receiving a vaccine—will be protected from something like measles. A recent measles outbreak stemming from Disneyland—and a series of 2014 outbreaks that caused more than 600 cases of measles in the United States—has concerned health officials, who blame the case increase on a growing number of parents (nicknamed “anti-vacciners” or “anti-vaxers”) who decide against vaccinating their children. The concern led California legislators to introduce a bill that would essentially prevent parents from making that decision for themselves. On Feb. 19, state Sens. Dr. Richard Pan—a pediatrician—(D-Sacramento) and Ben Allen (D-Santa Monica) introduced Senate Bill 277 (SB 277), which would repeal the “personal belief exemption” that currently allows parents to opt their children out of the vaccine requirements for schools. State Sen. Hannah-Beth Jackson (D-Santa Barbara) backs the bill and said it would make immunization from certain diseases, including measles and pertussis (whooping cough), a requirement for children, unless there’s a physical or medical condition preventing it. She said vaccines are helpful to both the individual and the community. The common good in the case of vaccines would be “herd immunity,” Jackson said, adding that the law enabling parents to opt out of vaccinating their children due to personal beliefs is 25 to 30 years old and originated at a time when vaccine-preventable diseases were thought to be epidemics of the past. State Sen. Bill Monning (D-Carmel)—who represents all of San Luis Obispo County—told New Times that he generally doesn’t take early positions on proposed legislation, but he’s looking forward to hearing testimony from all stakeholders on SB 277. On a less legislative and more philosophical level, Monning said the apparent erosion of societal confidence in the public health benefits of vaccines troubles him. Medical issues, religion, and philosophy are the biggest reasons parents choose not to immunize. SB 277 would get rid of the latter two as viable options, which doesn’t sit well with people like Robin, whose name has been changed because she wanted to remain anonymous. She has slender hands that are animated when she talks. It’s clear that she’s thought a lot about her point of view, and as she puts her sentences together, she pauses, trying to give voice to the description that exactly mirrors her thoughts. The Santa Maria native has two children: an 8-year-old son and a 4-year-old daughter. She said she’s not an anti-vaxer, but she does object to giving her children certain vaccines, and she doesn’t follow the recommended booster schedule, which advocates for infants to receive 10 immunizations before the age of 19 months. Robin’s preference is to wait until her children are at least 2 years old to start and to space out the vaccine doses. The discussion about vaccines is a difficult one, though, and Robin and her husband have spoken at length about the “right” way to do things for their children. They’ve decided to vaccinate their kids against what Robin considers to be more serious diseases: Polio. Tetanus. Diphtheria. She considers vaccine-preventable illnesses such as measles, chicken pox, and whooping cough to be relatively “benign” in terms of their impacts on overall health. Plus, she added, it’s about maintaining immunity into adulthood. 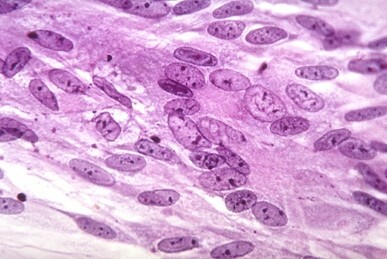 WHOOPING COUGH: This gram-stained micrograph depicts the virus that causes pertussis, also known as whooping cough. In 2014, there were 11,114 cases of pertussis in California. She also believes that vaccines can weaken a child’s immune system. Her daughter received the pertussis booster when she was an infant, and Robin said her daughter has been sick way more often than her son ever was (he didn’t receive the whooping cough vaccine and didn’t get any boosters before the age of 2). Plus, she added, how is someone supposed to know if their child is going to have an allergic or adverse reaction to a vaccine until they get the shot? At the moment, her son is past due on the second round of boosters he needs for polio, diphtheria, and tetanus, which are recommended between the ages of 4 and 6. She said the last time her son went to the doctor for immunizations the nurse who gave him the shots accidentally gave him an extra dose. Robin left feeling like she couldn’t trust the doctor’s office, and she’s not sure her son will get vaccinated in the future. On the vaccine side: Sometimes people don’t build up the antibodies they should to a disease. People can be allergic to what’s in a vaccine and go into anaphylactic shock or develop more serious complications that include death. The U.S. Health and Human Services Administration has paid out more than $2.8 billion in almost 4,000 cases of injury or death connected to vaccines since 1988 through the National Vaccine Injury Compensation Program. Between 2006 and 2013, more than 2.2 billion doses of vaccine were doled out in the United States. The compensation program is paid for through a 75-cent tax on every dose of a vaccine—so something like MMR (measles, mumps, and rubella) would be taxed at $2.25. The payouts were associated with a variety of vaccines. On the non-vaccine side: Your child could get one of the vaccine-preventable diseases, which—and, of course, the effects depend on the disease—could lead to permanent injury or death. But for health officials, some legislators, and most community members, it’s not about whether a parent can handle something. It’s not about the individual, but society as a whole. And it’s really all about the potential for permanent damage or death associated with these vaccine-preventable diseases and attempting to eradicate them from the face of the planet for good. Between Jan. 1 and Feb. 13 of this year, 144 people in 17 states and Washington, D.C., were reported to have measles, according to CDC statistics. Approximately 80 percent of those cases are connected to an outbreak that started at Disneyland in late December. Dr. Takashi Wada, director of Santa Barbara County’s Public Health Department, said about 20 percent of the current cases are ending up in the hospital. “These can be potentially serious illnesses,” he said. Measles symptoms appear within seven to 14 days of the person contracting the disease, and they typically begin with a high fever, cough, runny nose, and red watery eyes. Within two to three days, tiny white spots appear in the mouth, and three to seven days after symptoms begin a rash breaks out. Complications could include pneumonia, encephalitis (swelling of the brain), and/or ear infections that could result in permanent hearing loss. CDC statistics show that about one or two children out of every 1,000 who contract measles will die from it. 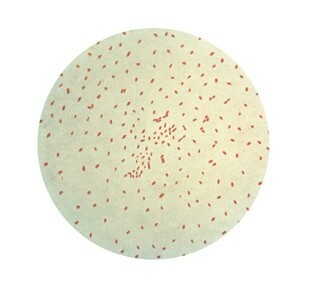 Between 1958 and 1962, an average of 503,000 measles cases were reported per year, with 432 associated deaths each year. The vaccine was licensed in 1963, and measles was officially labeled as “eradicated” on U.S. soil in 2000. The measles cases reported in the United States since then were brought in from outside the country, from places without widespread immunization practices, most recently from the Philippines and Vietnam. Measles isn’t the only vaccine-preventable disease that health officials say is making a comeback; there’s also whooping cough, or pertussis. Wada said there were more cases of whooping cough in California in 2014 than there have been in 70 years. In 2010, SLO County had the highest rate of whooping cough per 100,000 people in the entire nation. Nearly 400 cases of the disease broke out across the county before it was eventually contained. In 2014, Santa Barbara County had 114 cases of the disease, and in January 2015, the county recorded its first death ever from whooping cough, contracted by a 25-day-old infant. California health officials blame recent outbreaks on holes in the state’s herd immunity: pockets of people in communities who choose not to vaccinate. The California Department of Public Health tracks immunization rates of children through the school system. Immunization rates in SLO County are currently below the state average, as well as the 95 percent “herd immunity” threshold. Within the county, 2,982 students at public and private schools entered kindergarten for the 2014-15 school year, and parents of 165 students—or 5.53 percent—filed a personal belief exemption, according to CDPH data. In comparison, the statewide figure for percentage of kindergarten students with exemptions in 2014-15 was 2.54 percent. BOOSTERS: The CDPH recommends that children get their first boosters before 16 months of age because “younger babies often retain residual immunity against measles in the form of antibodies passed from their mothers. … By 12 months of age, these antibodies will have worn off,” Villatoro said, adding that waiting until children are older to vaccinate makes them unnecessarily vulnerable to vaccine-preventable diseases. Though SLO County Health Officer Dr. Penny Borenstein said that the county’s immunization rates are still far from ideal, she added that—thanks to a state law that took effect in early 2014—they’re trending in the right direction for the first time in a decade. That law, AB 2109, requires California parents who wish to file a personal belief exemption to see a doctor beforehand. That doctor must fully inform parents of the benefits and risks of vaccines. Among the 2013-14 incoming kindergarten class in SLO County, 8.26 percent of students filed exemptions, so 2014-15’s 5.53 percent figure actually represents a steep decline. Borenstein has been a practicing physician for 27 years and said she’s seen the vaccine debate become significantly more strident and divisive during that span. Borenstein added that it’s “not at all uncommon” for patients to circumvent doctors these days and insist on a certain diagnosis or medication. When asked for her best pitch to convince parents who might be skeptical about vaccination, Borenstein said it’s important to look at history. There’s a lot of data out there detailing the immunization rates of children, but what about adults? Santa Barbara County’s Public Health Director Takashi Wada said it’s hard to track such information for adults, because it’s not a prerequisite for most jobs. He added that a high percentage of the cases in the most recent measles outbreak are adults who were either unvaccinated, not up-to-date on their vaccines, or didn’t know their vaccine status. There’s also a percentage of the vaccinated population whose bodies didn’t develop the antibodies needed to be immune to the disease. Add to that the propensity for certain vaccine-driven immunities to wear off over time—Wada said measles is generally a life-long immunity, but whooping cough (pertussis) does eventually wane—and adults have a sort of immunity conundrum on their hands. So it’s hard to know if, as an adult, you have those antibodies you need for protection against vaccine-preventable diseases or if you’ve received the vaccines in the first place. Wada said adults can get a blood test to check their antibody levels—and, to be on the safe side, get a vaccine booster. Contact Santa Maria Sun Managing Editor Camillia Lanham at clanham@santamariasun.com. New Times Staff Writer Rhys Heyden contributed reporting.